Home » konad » mac » opi » OPI A Grape Fit! A Grape Fit! is a light lavender, I love this color so much I might wear it for 2 days. My koni was m62 I used MAC Vestral White instead of the SP because that's the one that streaks on me. It's not as bright white but with this light purple it was perfect! I wore 2 coats, definitely could have used 3. I posed with my topcoat because my bottle is a mini, it is so tiny! Isn't it the cutest little thing? 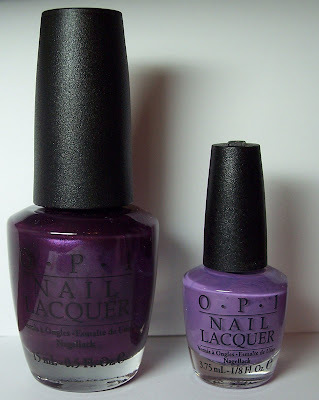 On the left is You Ottaware Purple, can't wait to try that soon! I have this color and just love it! Looks so pretty on your nails. The small bottles are cute...lol! Can't wait to see You Ottaware Purple. I've been interested in buying that one. The bottle is so petite, adorable! Very sweet color. Kae you've done another beautiful Konad. I love that color on you. The design is really lovely. I wouldn't blame you if you wore it as long as you could. hehe i think it's cause the picture is big, so the mini bottle actually looks normal sized and the normal sized bottle looks giantic! Is there any color that you can't wear?!? With each post it is clear to see you CAN wear any color. :-) Cute design too. Velvet: Thank you! I just love the bottles, one bad thing is if you need to shake it, no dice there's just no room to shake! I'll try the other purple next week. Clockwork: I agree! I am now interested in the other colors from the collection. Mary: My new favorite purple maybe! Céline: Thank you, I wonder if every company makes a mini, this might turn into a Pokemon thing gotta catch em all! Hi Olivia, thanks! I'm prepping my chopping arm for Saturday! Lucy: Thank you, I love the color too! I actually got all the designs on straight this time lol. Min: Yeah I'm glad this design it's forgiving with the wobbles and super cute. lol never saw it that way, king kong bottle! Denny: I can't wear beige or orange but I wear them anyway! Thanks I just love this design. Wan: Thank you, definitely try this soon it's very pretty! Nina: thanks, I really love this color too and the minis of course! I love this purple! I wanna try this and Do You Lilac It. And OMG where'd you get that tiny bottle??????? Sparklingpinkgorilla: Sorry Id idn't see this til now but the tiny minis I got in a set as a present. You can buy them online too I think at Transdesign.